Well, life in grhasta ashram (married life) is not just a piece of cake. My husband has a child from previous marriage (perfect example of Kali yoga) and the little boy is soon 4 years old. A happy boy, unknown to the miseries of the world. So being a bonus-mom is both a challenge and a gift. In one way I get good practice for when we get our own children, but on the other side I am raising a child that will never be "mine". I care for him as he was my own, but I know he will never be. The challenge is, that the way I would raise a child is different from how he gets raised with his mother, so then my rules has not so much value with the kid. The mothers words is always what is most important for a small child. 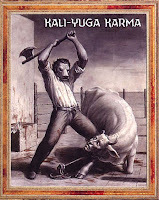 So that's one challenge in Kali yuga - the age where everything is quarrel and hypocrisy - the age where everything is upside down. My parents are also divorced, but luckily they waited until I was 18. It was not any easier for me, because all my memories of family life was with them together. But I do feel sad for all the Kali yuga children that are growing up and having to travel from one parent to another, having different rules and regulations and not having a mother and father in a solid core-family around to take care of them. Other than being a bonus-mom this weekend, we did a family trip to Moss to see a devotee couple of us that also has a child. It was really nice for all of us...nice for me to connect with the Mataji and for my husband to play mrdanga with the Prabhuji. And the children played together in peace. We took wonderful prasadam which the Prabhuji had prepared. He's really into sprouting grains and seeds, and knows so much about gardening. We were also gifted a homemade sambar spice, and I can't wait to try it! After some hours of sadhu sanga (association with holy men), looking at all the creative handmade and painted cupboards and enjoying a cup of warm tea, he gifts us one of his pieces. 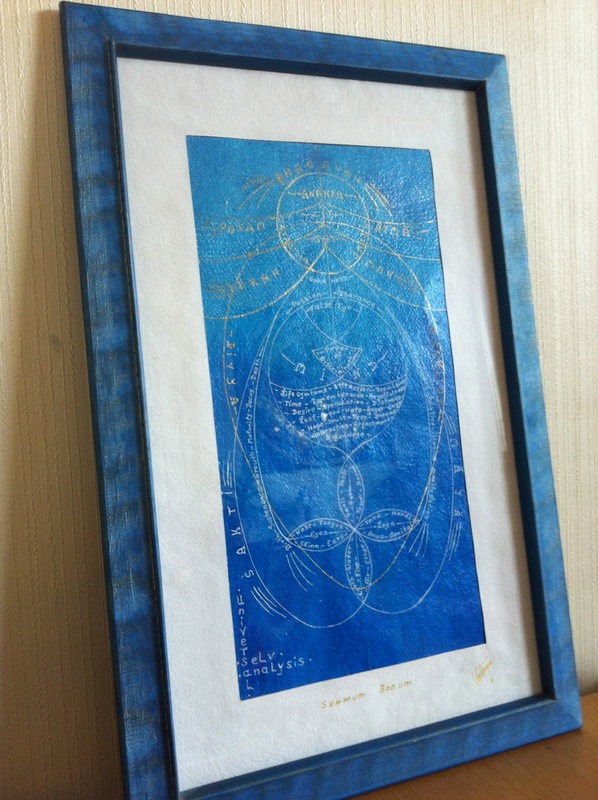 A beautiful and creative way of showing the Bhagavad Gita in a blue frame. So where do we find Krishna? Krishna Krishna.... it's so easy. God is everywhere. He is in the heart of all living entities. The dog, the cow, the ant, the fish and the human. He is present in all living creatures. 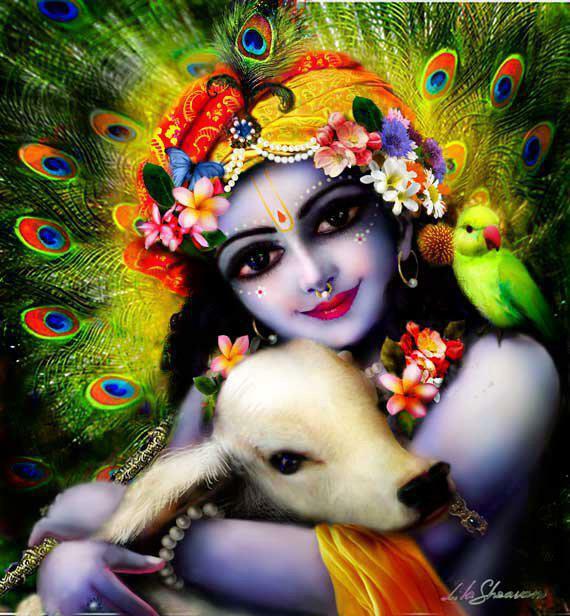 But how can we talk with God, how can we relate to Krishna? Prayer is more powerful than we can ever imagine, and we can do it anywhere. Personally I like sitting down and look at Krishna on our altar. I chant my japa and I pray to Krishna, "please make me your servant", "please engage me in your service". Connecting our japa with prayer is very empowering and we get more focused japa. Krishna is His words, so when you say Hare Krishna, you are directly associating with Him. He is here. Gopala - the protector of the cows. Govinda - the one who give the nectar of satisfaction to the senses and pleasure to the cows. Gopinath - Master of the gopis. Gaura Hari - the golden Lord. Keshav - killer of the Keshav demon. So we can find Krishna everywhere we look. And we might travel the world around to find God, but the best place to look is in the temple where none else goes. Look deep into your heart.